Orders with items that are in stock are processed and shipped within 48-72 business hours after the order is received. Orders are shipped via UPS Ground service unless otherwise designated or ordered. Expedited shipping options are available via UPS Overnight, UPS 2 Day, and UPS 3 Day. ALL express shipping orders placed after 1:00PM Pacific Standard Time Monday through Friday will ship the next business day. Express shipping does not include the day the order is shipped. UPS delivers Ground, Overnight, 2 Day and 3 Day orders Monday to Friday only. UPS does not deliver the above shipping options on Saturdays, Sundays, or holidays. The primary method of shipping is UPS Ground. Other carriers are available. 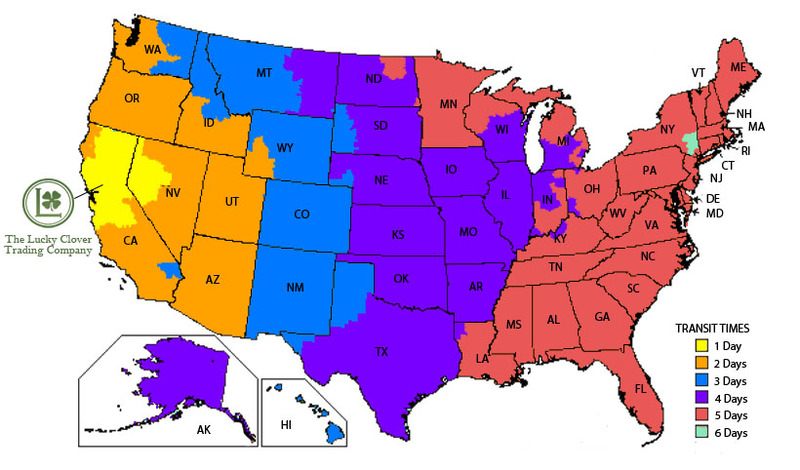 They include, but are not limited to: FedEx, the United States Postal Service (USPS) and common carrier freight lines. When choosing an alternate service, certain restrictions may apply and additional charges may result. The Lucky Clover Trading Co. will in good faith exercise its best discretion when choosing the carrier for shipment, taking into consideration the timeliness of delivery and quality of delivery service. It is the responsibility of the customer to verify the shipping address is correct prior to submitting the order. Customer may incur additional charges to have the shipping address changed if it is incorrect. The Lucky Clover Trading Company is not responsible for any charges due to customer error. The number of days an order is spent in transit via carrier is based on the number of business days following the day of shipment from our Benicia, CA warehouse (not including Saturday, Sunday or holidays). The above map provides an approximate guide. Weather, carrier failure, and other unforeseen events may cause delays in final arrival time. Such delays are not subject to freight refunds or adjustments. Orders to Alaska and Hawaii are shipped by the United States Postal Service (USPS) via Parcel Post or Priority Mail. Parcel Post delivery time is usually between 14-21 business days. Priority mail usually delivers within 3-7 business days. We ship throughout the continental United States, Alaska, Hawaii, and Canada (international). Please remember that the shipping cost calculated on all orders are based on dimensional weight or actual weight of boxes (whichever is greater). We will not issue a refund if the returned items are damaged, used, or altered in any manner. If you receive items that are damaged upon arrival within 14 business days from receipt, please contact us immediately at toll free 800.338.5825. We will either replace the damaged items OR offer a refund of the merchandise amount at our discretion. Please do not return the damaged items before you have had a chance to contact us first. If the item(s) received are a result of our error, please give us a call immediately at toll free 800.338.5825. Once your return is received, we will inspect the item(s) to make sure they are in good, resalable condition. A refund, less the shipping costs and less the $8.00 wholesale surcharge (if applicable) will be issued to your credit card (or original form of payment) within 3 to 5 business days after receipt and inspection of your return.